One of the top reasons diets fail is because of not keeping track of your food intake. Know how much you eat. It’s easy to hide things from yourself until you really pay attention. As annoying as it is, get a notebook and start to record what you eat – you will surprise yourself. Believe it or not by documenting everything you will get a better idea of how much you are putting on your plate and how much you are consuming. What treats are you keeping in the desk drawer that you usually graze on through the day? Do you really know how many you consume? Once you become aware of what a portion size is and what your plate should look like you will then be better equipped to manage your weight. Calories add up quickly. One tablespoon of some salad dressings have over 100 calories. Same with butter and an individual chip bag is at least that or more. Maybe you don’t realize just how quickly calories can add up. An extra tablespoon of salad dressing can add 75-100 calories, an extra tablespoon of butter adds 102 calories, and a bag of chips can add 150 or more calories. I know a guy who has a large, sweet, topped with whipped cream, specialty coffee each morning. Those are jammed with fat calories. Wine (any alcohol) is another source of calories that you may not be aware of. For other suggestions that may be adding to your waist see the The Inside Trainer article Why am I Gaining Weight. Keeping a food diary can make all the difference. 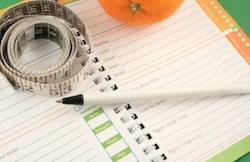 A food diary can be used to track your food, calories consumed and exercise. By doing this, as you record your weight loss – or gain, you now have a written record you can use to evaluate where you need to make changes. All you need to get started is a notebook. There are some nicely bound journals with pre-written suggestions of what to record and how to figure out your calories too. A diary or journal can help when you begin a new diet. You are already pumped up to try again and sure of your success this time so take advantage of this. You are likely being very conscious to eat healthily and chose the better food selections. You are also most likely to be making it on time to the gym at the beginning of your fitness journey – so write it all down. It is after the first week or two you will be more prone to slipping or giving in to cravings. As a matter of fact right about now you don’t want to write in your journal but NOW is when it will prove to be the most beneficial to you. Even if you do have a sweet treat of high calorie, over processed, full of fat, topped with icing, treat. That’s okay, just write it into the journal. There is space in your journal to note ‘why’ you had it, and after you have relieved your craving, make a note of how you think you can do better next time. No beating yourself up allowed! By keeping track of your caloric intake you will also be able to assess where you can make small changes if you find you have hit a plateau. Your food diary can help you to make other adjustments like adding more fruits and vegetables or maybe you’re not getting enough dairy or protein. Forming a new habit is repetition, repetition, repetition so by keeping a diary you are reinforcing your decision to live a healthful lifestyle. Writing in your food and exercise diary everyday and assessing what you have eaten you may learn a few surprises. Looking up the foods you consume could enlighten you to the fat content, caloric content and the chemicals in the foods you may not have been aware of. You can also use your food and exercise journal to plan ahead. Start to write out your healthful day ahead of time and make notations where you go off course. It can be anything from a late bus to a bad mood but this way you can start to think up mitigation’s for life’s little curve balls. After a little while you will want to fill in those pages in a way that you will be proud of. As you learn about the foods you eat and how you feel in relation to the exercise and nutrition you are having each day it will get easier to continue on that path because you will WANT to. Keep track of your calories and your exercise and you will have a greater and more exciting fitness adventure.